Get your 2017 VMF Wall Calendar! Volcan Mountain Foundation Board Members, Sharyl Massey and Jeff Holt, contributed striking images to the first-ever VMF Wall Calendar for 2017. A Gift From Mother Nature--Christmas Snow Pix & Happy New Year From Volcan Mountain! There's still time for you to make a 2016 gift to protect this beauty. CLICK HERE TO MAKE A DONATION NOW! This past weekend Mother Nature brought us an honest-to-goodness white Christmas! VMF Board Member, Sharyl Massey and husband, Dave, made their way up to Sky Island and captured these postcard images. 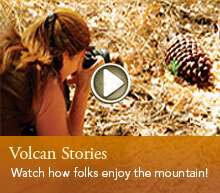 Read more about A Gift From Mother Nature--Christmas Snow Pix & Happy New Year From Volcan Mountain! Trail Closure Alert: Rangers of the San Diego County Parks, Mountain-Borrego Preserves have informed that the Five Oaks Trail of the Volcan Mountain Wilderness Preserve (VMWP) will be closed over this weekend until Monday, October 17th due to bee activity. Julian's Independence Day crowds had already headed back home at the start of the week, but there was still more to celebrate.